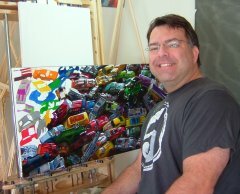 Steve Scheuring’s canvases glow with a brilliance and excitement that pulls the viewer into the painting. Images from the streets of Paris…markets in small Pennsylvania towns…and summers at the shore all come together into a growing collection of paintings that reveal more and more of the artist through his distinctive style. Copyright © 2019 Steve Scheuring Fine Art. All Rights Reserved.